The Raphael Cartoons are seven large cartoons for tapestries, now in the Victoria and Albert Museum, London, painted by the High Renaissance painter Raphael in 1515-16 and showing scenes from the Gospels and Acts of the Apostles. They are the only surviving members of a set of ten cartoons commissioned by Pope Leo X for tapestries for the Sistine Chapel in the Vatican Palace, which are still (on special occasions) hung below Michelangelo's famous ceiling. Reproduced in the form of prints, they rivalled Michelangelo's ceiling as the most famous and influential designs of the Renaissance, and were well known to all artists of the Renaissance and Baroque. Admiration of them reached its highest pitch in the 18th and 19th centuries; they were described as "the Parthenon sculptures of modern art". Raphael, whom Michelangelo greatly disliked, was highly conscious that his work would be seen beside the Sistine Chapel ceiling, which had been finished only two years before, and took great care perfecting his designs, which are among his largest and most complicated. Originally the set was intended to include 16 tapestries. Raphael was paid twice by Leo, in June 1515 and December 1516, the last payment apparently being upon completion of the work. Tapestries remained enormously prestigious; the Sistine set cost at least five times as much as Michelangelo's ceiling. Most of the expense was in the manufacture: although the creation of the tapestries in Brussels cost 15,000 ducats, Raphael was paid only 1,000. The cartoons are painted in a glue distemper medium on many sheets of paper glued together (as can be seen in the full-size illustrations); they are now mounted on a canvas backing. They are all slightly over 3 m (3 yd) tall, and from 3 to 5 m (3 to 5 yd) wide; the figures are therefore over-lifesize. Although some colours have faded, they are in general in very good condition. The tapestries are mirror-images of the cartoons, as they were worked from behind; Raphael's consciousness of this in his designs appears to be intermittent. Raphael's workshop would have assisted in their completion; they were finished with great care, and actually show a much more subtle range of colouring than was capable of being reproduced in a tapestry. Some small preparatory drawings also survive: one for The Conversion of the Proconsul is also in the Royal Collection, and the Getty Museum in Malibu has a figure study of St Paul Rending His Garments. There would have been other drawings for all the subjects, which have been lost; it was from these that the first prints were made. The seven cartoons were probably completed in 1516 and were then sent to Brussels, where the Vatican tapestries were woven by the workshop of Pieter van Aelst. Various other sets were made later, including one acquired by Henry VIII of England in 1542; King Francis I of France had another of similar date. Cartoons were sometimes returned with tapestries to the commissioner, but this clearly did not happen here. The tapestries had very wide and elaborate borders, also designed by Raphael, which these cartoons omit; presumably they had their own cartoons. The borders included ornamentation in an imitation of Ancient Roman relief sculptures and carved porphyry. The tapestries were made with both gold and silver thread; some were later burnt by soldiers to collect the precious metals. The first delivery was in 1517, and seven were displayed in the Chapel for Christmas in 1519 (then as now, their display was reserved for special occasions). Raphael knew that the final product of his work would be produced by craftsmen rendering his design in another medium; his efforts are therefore entirely concentrated on strong compositions and broad effects, rather than felicitous handling or detail. It was partly this that made the designs so effective in reduced print versions. The Raphael of the cartoons was revered by the Carracci, but the great period of their influence began with Nicolas Poussin, who borrowed heavily from them and "indeed exaggerated Raphael's style - or rather concentrated it, for he was working on a much smaller scale". Thereafter they remained the touchstone of one approach to history painting until at least the early 19th century - the Raphael whose influence the Pre-Raphaelites wanted to reject was perhaps above all the Raphael of the cartoons. Christ's Charge to Peter (Matthew 16:16-19) The key moment from the Gospels for the claims of the Papacy. The Death of Ananias (Acts 5:1-10). The Stoning of St Stephen (no cartoon) at which Paul (Saul) was present before his conversion. The Conversion of the Proconsul or The Blinding of Elymas (Acts 13:6-12). Paul has been invited to preach to the Roman proconsul of Paphos, Sergius Paulus, but is heckled by Elymas, a "magus", who Paul miraculously causes to go temporarily blind, thus converting the proconsul. The Sacrifice at Lystra (Acts 16:6). After Paul miraculously cures a cripple, the people of Lystra see him and his companion Barnabas (both standing left) as gods, and want to make a sacrifice to them. Paul tears his garments in disgust, whilst Barnabas speaks to the crowd, persuading the young man at centre to restrain the man with the sacrificial ax. St Paul in prison (no cartoon), smaller than the others. St Paul Preaching in Athens (Acts 17:16-34), the figure standing at the left in a red cap is a portrait of Leo; next to him is Janus Lascaris, a Greek scholar in Rome. The kneeling couple at the right were probably added by Giulio Romano, then an assistant to Raphael. The cartoons were bought from a Genoese collection in 1623 by Charles I of England, then still Prince of Wales, using agents. He only paid £300 for them, a price that suggests they were regarded as working designs rather than works of art in their own right. Charles in fact intended to make further tapestries from them at Mortlake (and did, with new borders, paying £500 each) but was well aware of their artistic significance. They had been cut into long vertical strips a yard wide, as was required for use on low-warp tapestry looms, and were only permanently rejoined in the 1690s at Hampton Court. In Charles' time they were stored in wooden boxes in the Banqueting House, Whitehall. They were one of the few items in the Royal Collection withheld from sale by Oliver Cromwell after Charles' execution. The fate of the other three cartoons from the set is unknown. William III commissioned Sir Christopher Wren and William Talman to design the "Cartoon Gallery" at Hampton Court Palace in 1699, specially to contain them. By this date the prestige of tapestries in general was beginning to wane, and those of the early sets that had survived were probably already rather faded and dirty. From this point on the cartoons became regarded as the most authentic and attractive expression of Raphael's conceptions. European taste had also moved in their favour; their dignified classicism was very much in tune with a movement away from the more frenzied versions of the Baroque. The fame of the cartoons, as opposed to the designs in general, grew rapidly. In 1763, when George III moved them to the newly-bought Buckingham House (now Buckingham Palace) there were protests in Parliament by John Wilkes and others, as they would no longer be accessible to the public (Hampton Court had long been open to visitors). They had been greatly studied by artists and cognoscenti alike whilst at Hampton Court, and played a crucial role in forming English expectations of a monumental style of painting - one of the great preoccupations of English art in the 18th century. They were often mentioned in the Discourses of Sir Joshua Reynolds, the dominant English critical work on art of the century. Having explained that "The principal works of modern art are in fresco" he specifically adds the cartoons "which, though not strictly to be called fresco, yet may be put under that denomination" before claiming that "Raffaelle ... stands in general foremost of the first painters..." (i.e. 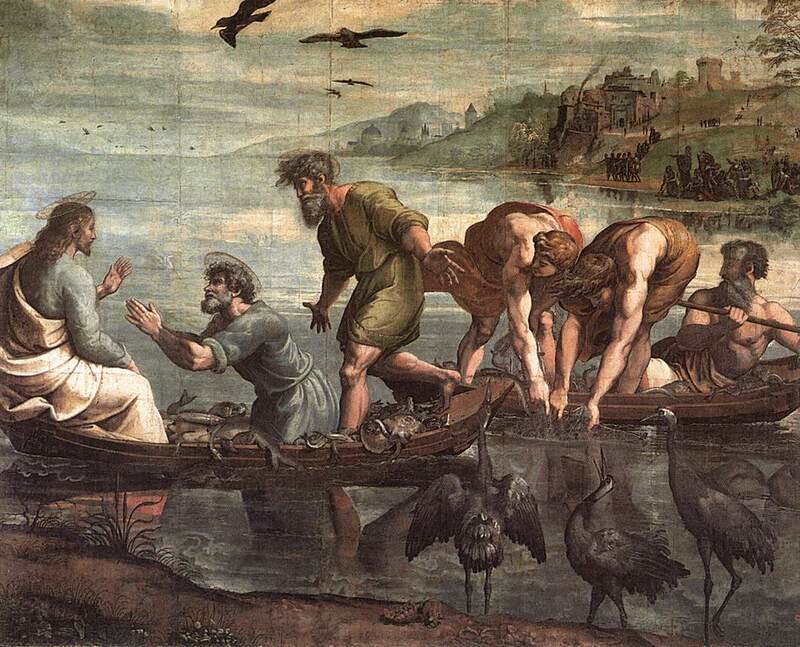 the best painters) and comparing Raphael's works in oil unfavourably to his frescoes. In the early 16th century many Italian artists learnt the lesson of the huge, and very rapid, international prestige that Albrecht Dürer had gained through his prints, and set out to emulate him. Raphael had no knowledge of printmaking himself, and was probably too busy to want to learn the techniques, but he was the most successful of the Italians in spreading his fame through prints, through his much debated relationship with the engraver Marcantonio Raimondi and his workshop. Raphael made many drawings solely as designs for prints, and the workshop made a large number of prints, apparently working always from drawings rather than the finished work, of Raphael's paintings in the Vatican and elsewhere; the tapestry designs were no exception. These prints themselves were very widely copied by other printmakers, and spread rapidly through Europe. The earliest datable print after one of the designs is an engraving of 1516 by Agostino Veneziano, then working in the workshop of Marcantonio Raimondi, of the Death of Ananias, This was probably made even before that tapestry was woven. The composition is in the same direction as the tapestry, but since the printmaking process would also reverse the direction of the composition, this almost certainly means it was deliberately reversed compared to the detailed preparatory drawing in the Royal Collection on which it was based (see above; the two agree in all details), probably by taking a counterprint from the chalk drawing. All Raimondi and Veneziano's prints of Raphael's designs in Raphael's lifetime were based on drawings, according to both Landau and Pons. Raimondi himself engraved one of the set, which were presumably all produced around 1516, so that even many in the Roman art world may have seen prints of the designs before they saw the tapestries themselves. A later large set of engravings by Matthaeus Merian the Elder illustrating the Bible, from around the end of the century, used some of the compositions, slightly increasing the height, and elaborating them. These were much used and copied in popular books, further widening the knowledge of the designs to a much larger audience. After the cartoons were reassembled at the end of the 17th century, by which time printmakers were well accustomed to copying direct from large paintings, they became the dominant source of new print copies. By the 18th century many different print versions were in circulation, of varying faithfulness and quality. ↑ Raphael's Tapestries and Their Cartoons,John White, John Shearman, The Art Bulletin, Vol. 40, No. 3 (Sep., 1958), pp. 193-221. Rather oddly, both Jones & Penny and Grove Art say, wrongly, that the V&A have eight of the ten cartoons. ↑ Quoted in Wölfflin, Heinrich; Classic Art; An Introduction to the Renaissance, p. 108, 1952 in English (1968 edition), Phaidon, New York. ↑ V&A website on the colouring. Wölfflin:108 believed they were entirely executed by Penni, one of Raphael's studio, but Jones and Penny and most writers now believe Raphael did much of the painting himself. ↑ The Getty: St. Paul Rending his Garments. ↑ A good photo of The Miraculous Draught of Fishes from a slightly later set of 1545-57 from the Metropolitan.